Hi Friends: There is a new challenge today over at the Crafting When We Can Challenges Blog, where the current theme is Christmas. 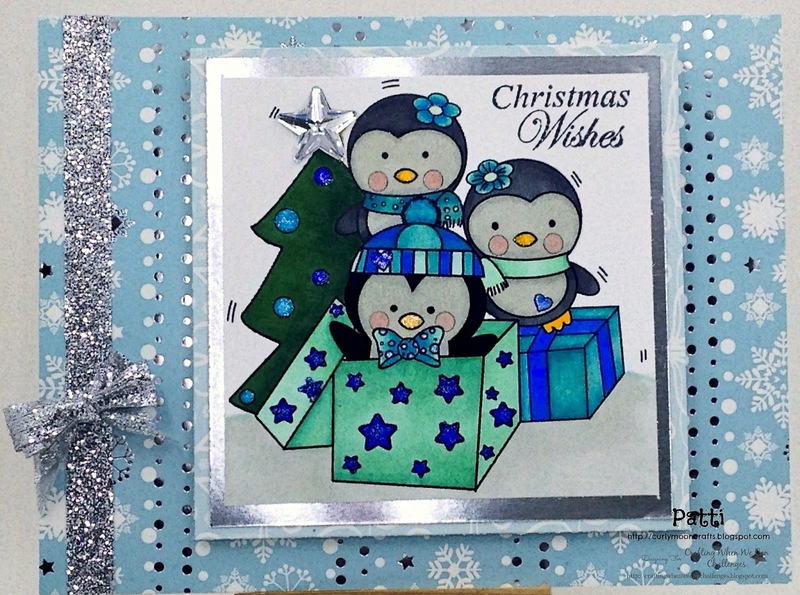 My creation for this challenge is a card using the super cute digital image called Christmas Penguins. Thanks for stopping by and have a great CRAFTY day! Merry Christmas! I printed the image onto smooth white cardstock and colored it with my Spectrum Noir Markers. For some extra Christmassy shimmer, I added some glitter pen to the stars, ornaments, hearts, and flower centers. I stamped the sentiment with black ink, then added a mirrored star to the top of the tree. I added the background paper to the card base and put some silver glitter ribbon along the edge. For the focal image, I double matted it and added it to the card base with fun foam. I love your color choices! Such a fun holiday card. Love the color choices. Such a fun holiday card!